Thanksgiving break is around the corner and you can barely wait to go home and spend time with family and friends. 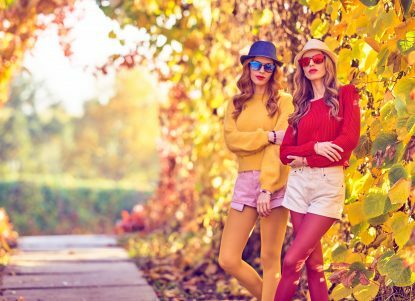 Whether you are doing something casual with family or visiting some friends in a big city to celebrate Thanksgiving Day, you want not only to feel good but also look good. 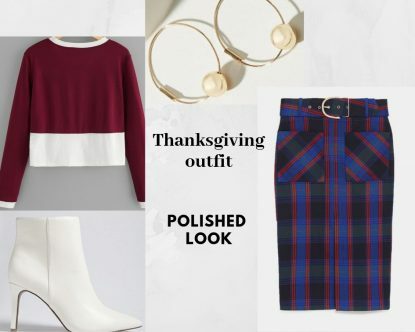 Here are a few Thanksgiving outfit ideas that I hope they will inspire you. 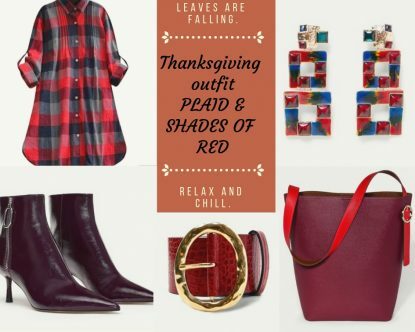 You will never go wrong wearing fall colors! Shades of brown are the Fall clothing colors of the season that radiate warmth and perfectly match with the harmonious celebration of Thanksgiving. 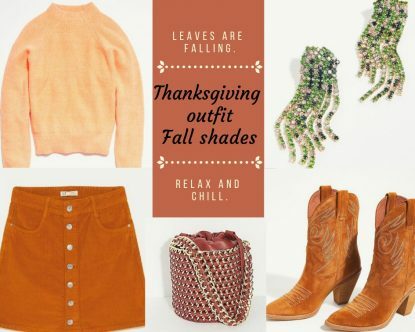 A corduroy skirt and a soft sweater paired with cowboy boots, the most wearable trend so far, is an outfit that you can wear for Thanksgiving dinner. Finish the look with a natural makeup and make a fashion statement with a pair of rhinestone multicolor earrings. Thanksgiving dinner in the city calls for a simple yet polished outfit. A pencil skirt and a color block striped tee paired with sleek white boots elevate the outfit giving a finishing touch. Pearls and hoops earrings are simple and minimal jewelry yet look effortlessly chic and make your outfit look well put together. Classy yet trendy, plaid is a traditional and versatile print that you can wear from Thanksgiving till Christmas time. A classic retro plaid shirt dress can look modern with the right accessories. Wear a belt to give shape and proportion and paired it with pointed-toe knee boots for a polished look. Finish the look with dazzling earrings and you won’t believe how easily accessories can transform an outfit. Whatever you do and wherever you go this Thanksgiving, don’t forget that dressing appropriately is a form of good manners and shows a sign of respect and consideration for your family and friends. Follow the link to learn more about manners and etiquette.